Victoria - This is a study that comes from the Royal Society's Journal Interface and in this case, they're looking at beetle feet. 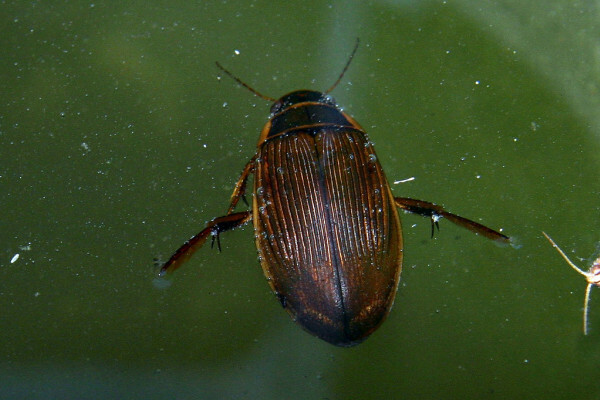 Now, these are particularly amazing beetles because they're diving beetles. These quite large carnivorous beetles, though they breath air at the surface. They spend most of their life in the water. That means that they have to mate underwater as well. How they do this is when they're in the water, they mount onto the females and they have to keep hold of the females in this aquatic environment and they've actually evolved special limbs that stick to the female's bodies to do this. So, that's what this team were asking. They wanted to work out how these feet stick to the female beetle's body in this reversible way because if the male stays stuck to the female, he might not be able to get to the surface to breathe and they figured out exactly how this amazing beetle feet work. Chris - How do they work? What do they do? Victoria - So, they've actually looked at a very, very fine scale with microscopes, essentially filming these beetle feet attaching and detaching from the female body, and they've measured the forces that are produced, the strength of this attachment. They produce these amazing videos that you can see on the Naked Scientists' website. What they reveal is that there are physical structures on the bristles on the ends of the beetle's feet - tiny little plunges or suction cups. So, they looked at two species and one of them - the more primitive species - has little spatulas on the ends of these bristles that sort of act like a reversible tape that sort of slide over the female's body and seem to have some kind of adhesion and they slide around and then peel off. The other more evolved beetle has even more amazing bristles on its feet. It has tiny little - what look like sink plunges - the little circular suction cups that actually stick to the female with this pressure and then can be just pulled off and released. They look just like a sink plunger. It's really remarkable at the fine scale. Chris - If they stick on and they stick on really hard, how do they get them off again? Victoria - That was one of the things that surprised them because the more primitive beetle has what just looks like a bristle with a flat end. It looks kind of like just a spatula that sort of slaps down onto the female's body. But actually, it has these little fine hairs that attach like sticky tape and it has channels on these hairs that allow liquid to seep through. So, it's like an adhesive sticky tape that seems to work underwater. So, that's how that works by peeling those spatulas slowly off the female's body. They can detach easily. The suction cups, it's literally like a suction cup device that we might stick up a sign onto a window or something like that. They just attach and then they pull off. So, you can see it in these videos. They put one of these suction cups onto a female's body and then they just pull it off and you just see that with additional force, they have to sort of release themselves with a bit of a tug but it just pops off. Chris - This is all very interesting from a biology point of view, but I can hear the man and woman in the street saying, "Why are we spending..." Well Chinese taxpayer's money looking at this, but why is this useful? Victoria - Well actually, biomimetic in general is an area that's really, really useful in terms of robot design. There's a lot of designers of flying robots and drones that are looking at the way animals fly in order to produce more efficient and smaller and more miniaturised drones. Spider silk is another classic example where nature can do something that we can't do, really produce something that's incredibly stretchy, incredibly tough, and incredibly strong. This is another challenge. Actually, sticking things together underwater is really, really tricky. We've got loads of adhesives and engineering devices that can stick things together in air, but aquatic environments make things like adhesives really, really difficult. So, if we can see how animals are managing this in a reversible, really efficient way as part of their life and part of their method of survival, then this is very fundamental start to being able to do something that we'd be able to use in engineering. You can imagine underwater engineering in terms of shipping, in terms of bridge building. It's actually really important.